Rudolf Klemm was born on 10 February 1918 at Haltingen in the Lörrach region of Baden. He joined the Luftwaffe in 1937. Following several years as a flying instructor, Klemm was transferred to JG 54, based on the Eastern front, in December 1941. Oberfeldwebel Klemm was assigned to 8./JG 54. He gained his first victory on 7 February 1942. Klemm claimed a further victory on 4 April, which was also the 2,000th victory recorded by JG 54. He claimed 10 victories in September, including five Russian fighters shot down on 29 September to record his eighth through 12th victories. When III./JG 54 was relocated to the Western front, Klemm had 23 victories to his credit. In March 1943, Klemm was promoted to officer rank and was transferred to 9./JG 54. On 17 April, he claimed his first four-engine bomber shot down: a USAAF B-17 15km southwest of Ahlhorn. On 14 May, he claimed his 25th victory but then his Bf 109 G-4 (W.Nr. 16 144) “Yellow 10” was hit by German flak and he was wounded, blinding him in one eye. Despite this handicap, Klemm returned to combat duty some weeks later. In November 1943, Klemm transferred to the Stabsstaffel of III./JG 54. On 1 February 1944, Klemm was appointed Staffelkapitän of 7./JG 54. He had accumulated 27 victories at this time. He recorded his 32nd victory on 8 April. On 9 April he was shot down and wounded in Bf 109 G-6 (W.Nr. 15 573) “White 1” by escorting USAAF P-47 fighters. Subsequently, two toes had to be amputated. Klemm was transferred to IV./JG 54 based on the Eastern front in summer 1944. Hauptmann Klemm was awarded the Ritterkreuz on 18 November for 39 victories. On 1 December, Klemm was appointed Gruppenkommandeur of IV./JG 54. He led the Gruppe until its dissolution in February 1945. On 15 February 1945, Klemm was appointed Gruppenkommandeur of III./JG 54 based on the Western front under the control of JG 26. He replaced Hauptmann Robert “Bazi” Weiß (121 victories, RK-EL) who had been shot down and killed on 29 December 1944. III./JG 54 was redesignated IV./JG 26 on 25 February and was based at Varrelbusch. On 19 March 1945, he claimed his 42nd, and last, victory when he shot down a USAAF P-51 fighter 10km northwest of Nordhorn. Klemm received orders to report to JG 7 on 17 April 1945. He was destined never to reach the unit before the end of the war. 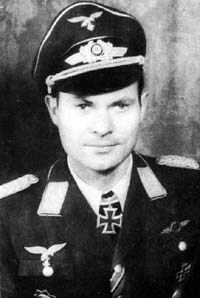 Rudolf Klemm was credited with 42 victories in 293 missions. He recorded 13 victories over the Western front, including 8 four-engine bombers.